Dear fans of the NBC’s drama ‘This Is Us’: this article contains the lightest touch of spoilers that we could sprinkle in. We will be discussing (as vaguely as we can) events that occur near the end of Season 2, and how a real-world company has handled some surprising fan reactions. These events relate to an ongoing plot that has been at play for most of the show’s run. We won’t say which plot, or which characters, but we will have to say a little about the company at the center of it all. So if you aren’t caught up and have a zero-tolerance policy for information about how the Pearsons are doing, just go watch the show. When this week’s episode ended, fans were hot with emotion. In typical ‘This Is Us’ fashion, the episode’s cliffhanger left many fans flustered, sad, angry, and confused about what to do next. For many fans, they took it out on the scapegoat in their kitchen: the Crock-Pot. The brand saw itself on the receiving end of social media’s fury last week for the small part their slow-cooker product played in the episode. Fans seeking some form of catharsis unleashed their emotions onto their own slow cookers, as the trending tab of Twitter turned into an abusive slideshow of Crock-Pot insults. Not used to being the center of anything besides a potluck, Crock-Pot quickly took to social media to try and defend their brand. A new Twitter account was created, and the company’s social media team began making amends. We totally get it! Last night’s episode was ?, & we’re still not over it either! We want to assure you that we’re committed to safety & you can continue to use our products with confidence. We test our #CROCKPOT rigorously before they hit shelves. Pls DM us with any questions. We get why people are upset. But in all seriousness we want people to know that they are safe when using a #CrockPot Slow Cooker. ‘This Is Us’ writer Dan Fogelman took to Twitter to defend the company as well. Their Facebook also has a lengthy response for fans of the show (WARNING: that post contains spoilers). We won’t post it here, but check it out if you’re feeling distraught. The situation brings up an interesting conundrum. How do businesses react to uncontrollable brand damage? There was no way of Crock-Pot knowing how bad the backlash would be, and no real way for NBC to expect — and subsequently warn Crock-Pot of — that kind of a response. So what is the right approach? The most important distinction to be made in Crock-Pot’s reaction is that it is aggressively reactionary. The company created a new Twitter account to interact with fans tweeting how angry they are with the device, but the Crock-Pot brand didn’t have a Twitter account before this incident. You may not think a company like Crock-Pot needs a Twitter, but for modern companies, it is nothing less than a liability to not be in touch with your audience. If we had asked at the beginning of the week what your opinion of the “Crock-Pot” brand was, what would you say? For most people, the only words that would come to mind would be some variation of “good,” “useful,” and “reliable.” Now here comes a primetime, Emmy-award winning show to indirectly tarnish the company’s reputation — the primary thing still getting people to buy Crock-Pots. Seriously, what other product out there has a more stable brand identity? Elmer’s glue? Morton’s salt? While this situation obviously can’t be anticipated, it’s important for businesses to at least have the tools and internal architecture needed to respond to something like this. This case is a testament that every company, no matter the product, market, or brand strength, should have a dedicated social media, PR, and digital marketing team on standby. You never know when you’ll be blindsided by the wrath of Twitter. On top of having the right kind of hose to put out the PR fire, companies need to be savvy about how they put out the fire. The Crock-Pot strategy? Direct responses. As noted above, Crock-Pot decided the best course of action was to reply directly to people who were showing unwarranted frustration with their product. They created a new account, pinned a post on Facebook, and have been effectively shouting from the rooftops that their product does not deserve the hate it is receiving. This strategy may, in fact, be the right one for Crock-Pot; most people associate the brand’s with warm, home-cooked meals and a sense of familial togetherness. So it’s on-brand to respond with sincerity, compassion, and personalized assurances. Crock-Pot may not be the kind of brand that wants to utilize this buzz to their advantage with a spin tactic. They’ve stayed fairly vanilla in how they’ve handled things, and maybe that’s a good thing. This isn’t the only way to go about it though. Social media has proven that any brand can have a unique voice and use it to their advantage, regardless of the situation. Take the notorious Moon Pie Twitter account. The company sells packaged pastry snacks, but their Twitter account has expanded their audience by having a fun personality. Furthermore, Crock-Pot is in desperate need of new business guidance. Reports coming out just before the episode showed the parent company, Newell, had already seen stock prices drop 49% since their record mark last June. Since the episode aired, the Crock-Pot product’s stock prices have also plummetted, dropping 24%. While the attention from the episode has been negative, the one benefit has been the Crock-Pot brand is now in the forefront of pop culture for a brief period of time. For a company in desperate need of some magic, it doesn’t appear as though they are utilizing their moment in the spotlight as the opportunity it is. Are there other social media/marketing strategies which could have been implemented to turn this into a win for Crock-Pot and Newell? Could this have been spun to their advantage? Possibly, but it’s difficult to expect anything better from the company when they didn’t prepare themselves beforehand. Pop culture blows such as this are often short-lived. People, businesses, brands, they’ve all come back from worse blows — blows that they themselves might have caused — and turned out fine on the other side. But it’s still disappointing to see such an opportunity being handled in the most bare-bones fashion. For all the negativity this episode brought, what was provided was attention, something that is as critical to harness as it is difficult to obtain. When businesses get a shot like this, it’s in their best interest to do more than damage control. Crock-Pot, so far, has been doing an OK job, all things considered. And for a company that didn’t have a Twitter account before this week, that could be considered a win. But how many executives are ever satisfied with an OK job? There’s always a way out for a company’s PR nightmares. But if you aren’t prepared, you limit your options. This might seem like a given; when you post something on social media, it goes across the world. However, there is more to the concept of sharing without borders. For instance, what exactly constitutes as a border? A border doesn’t have to be what separates Mexico from being America. Borders can be physical, political, national, political, religious, cultural, economic, and can be defined in many ways and as other types. Borders can, and usually do consist of more than one category from those just named, and can include other categories, as well. A physical / political boundary may be the first kind of border commonly considered, but that’s not the limit to what it means. Social media is the medium by which people network, such as web sites and computer applications and mobile phone apps that allow people to share communications via messages, pictures, images, files, audio, and video, or some part or combination of these. Well known social media includes Facebook, Twitter, LinkedIn, Snapchat, Pinterest, and many more such communities that allow people to share ideas, thoughts, and conduct online conversations by posting messages and other items of interest. What Are Some Kinds of Sharing Without Borders? Some organizations are engaging volunteers, teaching children, raising funds by various means including bake sales, cupcake auctions, blogs, and more. Chefs are teaching children how to cook, and many bloggers and local groups around the country are reaching out to help children to have enough healthy food. No Kid Hungry is one force behind this movement. Doctors Without Borders/Médecins Sans Frontières (MSF) was started in France in 1971, and has provided medical care in over 60 countries. The Nobel Peace Prize was awarded to the group in 1999. Social media such as Tumblr, Twitter, and Facebook is part of how MSF communicates the needs of people in desperate situations, and gains private support for their work. Concerns and needs such as the malnutrition intervention, obstetrics, surgeries, and much more. Collegiate Research combines the expertise and experience of professors, and sometimes students, across different campuses and in different nations to advance the search for answers, solutions, and scholarship itself. Columbia University is an example of a school taking an active role in pursuing this kind of social media sharing. Business and tax planning across international borders is another realm through which knowledge is shared through articles and comments. One law firm with offices in New Jersey, New York, and Pennsylvania actively pursues international business opportunities and service using social media; in their case, a blog serves to communicate on many topics. Recruiters looking for qualified employees are increasing their use of social media to identify and reach out to potential job candidates. LinkedIn is widely considered to be the largest social media platform for professionals in the workforce, and it’s not unusual for members to be presented with job opportunities, whether or not they have actually looked for a new job. LinkedIn also has a number of ‘groups’ to allow people who share common interests to conduct interesting discussions, find new ideas, market they or their business, and much more. Other social media sites have similar groups, too. Using the Internet as a communication’s tool, political borders are seldom a barrier to sharing ideas, doing business, making friends, or finding talent. In recent years, social media has truly made it much easier than ever before to accomplish sharing without borders. Everyone needs inspiration. Some of us realize that we do. But where do you get inspiration when your “well of ideas” has run dry? It might be as simple as logging into Twitter and seeing what everyone else is saying. Social media can be an excellent source of inspiration, insight, and useful information. It can spark a new idea, or give you more information so you can get involved in a conversation that’s already happening. Most social media is regularly updated and covers a wide range of subject matter. You can even learn how to create a mobile phone app – with no experience! Many social networking platforms allow for conversation; questions asked and answered, and more. Of course, there are two sides to social media. There are people who know what they are talking about and get either get validation or insight from others. Other people display an unfounded ego, arrogance, and ignorance are, at least with some social platforms, exposed, and their input invalidated by the social networking community. Those who frequently give speeches or write for others often have a good level of expertise and experience with a particular field or topic. Unfortunately, continually drawing from the same well of knowledge can leave the writer or speaker with a diminished level of ‘sparkle,’ which in turn could bore the audience. Studying conventional reference and instructional material can bore the true expert, and further degrade the passion for presenting speeches and writing. Boring speakers don’t get hired again. Social media channels can come to the rescue. There are private groups on Facebook, Twitter, LinkedIn, and other social media sites. These groups are often moderated by a knowledgeable person. They frequently screen applications for membership to those groups; this helps to protect the integrity and quality of the group. Often times, the social media channels we choose to follow are actually part of a larger site. For instance, a pastor might get inspiration from Christianity.com and choose to follow them on Twitter. Not only does the pastor get the information from the website, but he can see some of the conversations others are having. On these and similar sites, audio, articles, conversational blogs, and even video can lift the spirits, provide information, and encourage pastors and other speakers, teachers, and writers. Business owners and bloggers have some of the most information available. From Entrepreneur to Forbes, the popular online journals and magazines targeted at business advice have strong social media presences. They often post news and editorials that address strategies and big things happening in the industry. When looking for inspiration for that blog piece, or even trying to find a new way of approaching your own social media presence, following the Twitter or Facebook account of a company that does it right and you respect is one of the best ways to not only get inspired, but get things done correctly. If you’re not coming up with something new, chances are you’re losing out to a company that is. However, inspiration isn’t limited to figuring out a business proposal or blog post. The type of inspiration and information available through websites and social media can spread into some of the most important aspects of our lives. Parents, who often face unfamiliar challenges, unpredictable behavior, and how to guide their children can get information, have online discussions, as questions, and more from sites such as Parenting.com. Such sites often offer ways for readers to interact with authors, writers, and each other. This isn’t the type of inspiration that will lead to stronger sales, but it is the type of inspiration that can push you through the day, and even figure out a new and interesting way to shake up an old routine and get back into gear. 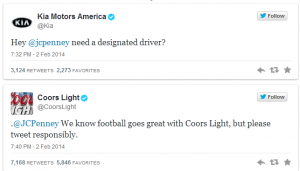 Are Tweets the Ticket to the Super Bowl? Even as a Seattle fan, it got a little boring watching the Broncos continually hand the ball over. After feeling pretty confident the Seahawks were bringing it home, I wound up perusing through Twitter. 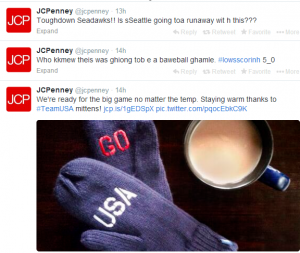 It seemed like JCPenney was having as rough a first half of the game as the Broncos. 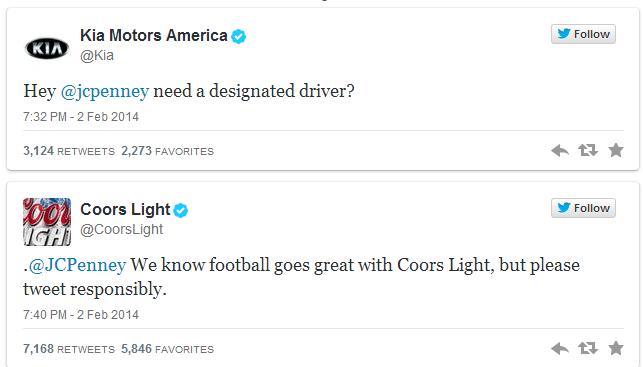 The company sent out two tweets that appeared to be written under the influence of a few too many super bowl cocktails. However, afterwards, they send out a tweet with a picture of their new mittens, apologizing for the typos. Was this a planned publicity stunt or a well-handled blunder? Judging by the prepared image that was sent out after the fact, I would have to guess that this was fully planned. However, the huge response couldn’t have been planned. Twitter users across the board were re-tweeting the messages, making jokes about the brand being too inebriated to have a Twitter account. However, possibly even better handled was Snickers. Whoever is in charge of their Twitter account made a perfectly executed reply, shown in the image below. 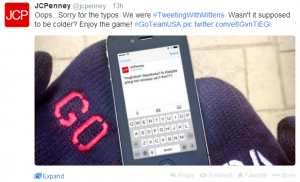 Snickers wasn’t the only one who jumped on board and offered J.C. Penney help with their tweeting problem. The interesting part? 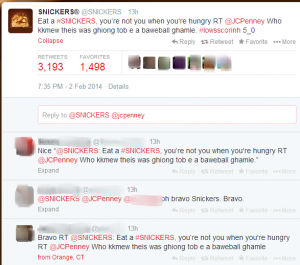 None of the brands that were part of the Twitter conversation were advertisers in the Super Bowl. With a 30 second commercial costing $4 million, it’s no surprise a lot of brands decided against the splurge in advertising this year, but it seems a lot of them have taken to social media. Rather than spending millions on short, highly competitive air space, there seemed to be more happening on social media. It also felt like every commercial was trying to start its own hashtag. It makes me wonder what the future of Super Bowl advertisements will look like, and whether or not companies that do decide to spend the money on these advertisements are getting their money’s worth. While on Twitter, I didn’t see any #StayRestless conversations, or #VW for the Volkswagen commercial, yet there were thousands of shares for the brands that stuck to the Twitterverse. 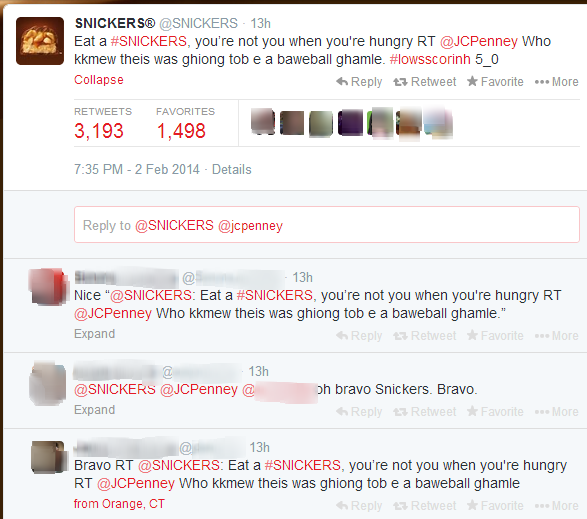 While Jeep’s tweet with the hashtag they paid millions of dollars for with their commercial got 15 retweets and 23 favorites, the reply Snickers sent out about JCPenney’s tweet alone got 3,193 retweets and 1,489 favorites. It will be interesting to see in the next few years whether the classic Super Bowl commercials will stay the course or if Twitter or Facebook stunts like J.C. Penney’s will take over the main stage. https://orpical.com/wp-content/uploads/2014/02/super-bowl.png 854 1280 Orpical https://orpical.com/wp-content/uploads/2013/04/OrpicalGroup-HighRes-06-300x125.png Orpical2014-02-03 19:05:392014-08-22 17:38:37Are Tweets the Ticket to the Super Bowl? Consider The Burma-Vita Company, a company Pre-Facebook, owned by Clinton Odell. Sales of their liniment were ‘sparse,’ so in 1925 the company introduced a product with wider appeal. The result was Burma-Shave, a new, ‘brush-less’ shaving cream. American culture at that time included the assumption that most employees and most drivers were males, during a time that full face beards weren’t common in most parts. Many towns then and now have restrictions on the number and size of commercial signs on the roadside. With almost no limited-access high speed highways, most people were thrilled to drive speeds once described as “a mile a minute.” So, we have men (who for the most part shaved daily) on well-traveled highways, moving at comparatively slow speeds over long distances, with little to do, but drive. Did we mention there were no cell phones (the first real world cell phone call was in 1973), and CB (Citizen’s Band) radio, although an earlier technology was invented in 1940, didn’t become truly widespread outside of license-holder groups until 1975; prior to the late 1970s a license was required. “HAM” radio was expensive and required the passing of tests showing considerable technical acumen. Distractions or entertainment? No Sirius satellite radio. FM radio wasn’t invented yet. 8-track tapes, cassettes, Compact discs? Future, science fiction stuff in 1925. I know. I know. How did people survive! Today, anyone without an iPhone seems like a caveman. But modern reality in 1925, and for about 40 years was boredom on the road. The company had the new Burma-Shave product, and the son of the owner, Allan Odell, had an idea: pay attention to the cost-effective, result-generating possibilities of focused target marketing and advertisements that potential customers loved to see. In modern parlance, RTM (routes-to-market). Then came the Burma-Shave signs with their witty, funny, and effective ad slogans spaced out over some distance on the highway driven by men who looked forward to reading the next sign. This was marketing genius. With a 1925 marketing budget of $250, sales increased dramatically. Imagine: advertisements that prospects loved to read. Burma-Shave signs, starting in Minnesota, were in 45 States, including along Route 66; which was the name of a popular TV show aired from 1960 – 1964. It was ironically the same time that the new Interstate highways were being developed. Route 66 still carries an air of legend and was even featured in the 2006 Disney / Pixar movie, “Cars.” Burma-Shave ads were well loved part of the American way of life. The demise of the Burma-Shave signs, and also the loss of the incredibly increased sales that came (and went) with the three-foot signs was caused mostly by the increased speeds allowed by the new Interstate Highways authorized by legislation passed June 29, 1956. The creation of the “National System of Interstate and Defense Highways” mostly bypassed the highways of the 1920s that involved slower driving speeds. The roads with Burma-shave signs were becoming less traveled. Huge billboards replaced the three foot painted signs, along with the ability to actually see, and want to see, the Burma- shave roadside ad campaigns. The signs are mostly now in museums, and the once-wonderful sales revenues went out with a whimper. So did the company, which was sold in 1963. Online discussion groups have men relating that they were fortunate enough to have actually found Burma-Shave products sometime in the past several years. The Burma-Shave brush-less shaving cream was discontinued, with the company itself in 1966. 1997 saw the re-introduction of the Burma-Shave company, but no actual Burma-Shave brush-less shaving cream. The genius of low cost, high return and great RTM principles and strategies used by Burma-Shave was a force that changed the practice and science of effective advertising. However, as Burma-Shave discovered, irrelevance will cost you. When the climate of your prospects change, as with the introduction of Interstate highways, failure to adjust to current realities will cost you time and money. Burma-Shave failed to adapt their marketing strategies to current realities, and the result was a catastrophic loss of sales revenue leading to the sale of the business, and its ultimate shut-down. The list of social media platforms goes on and on. The most appropriate social networking sites that will yield the most favorable audience for your business could be completely different days, months or years from right now. Remember Burma-Shave. Emulate their smart, out-of-the-box moves, but don’t make the mistake of failing to realize that the cultural environment is subject to change. Plain and simple, your social media strategy should resemble a gymnast. Strong, agile, balanced, able to take direction—and of course, flexible. With these qualities, your social media practices are poised to bring home the gold on a consistent basis.